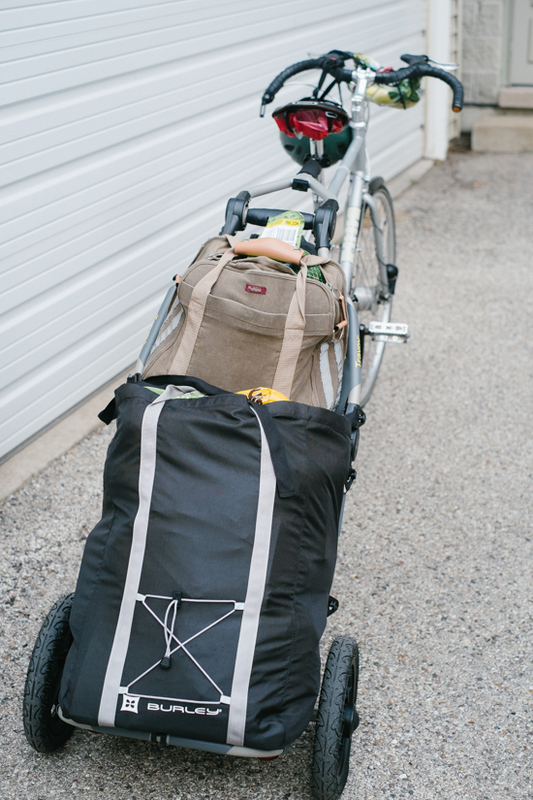 We love our Burley Travoy! It is very, very light and tows incredibly easily. Even when full, I don’t notice much difference in pedaling difficulty. My only “complaint” – and it is a minor one – is that although it will fold up into a very small space, it takes a bit of practice to get proficient at doing so. 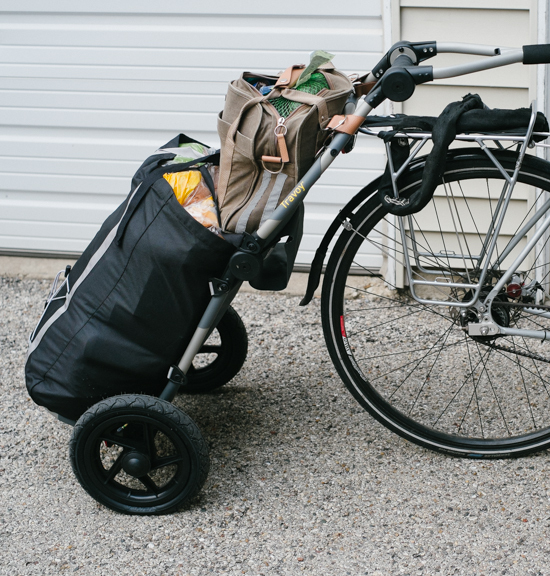 My kids have outgrown my (used) double Chariot, but I sometimes use it for hauling groceries or other bulky items like bikes. S, that’s a good use for an old trailer. I actually looked around on Craigslist to see if I could find a deal before buying a new Travoy. I considered buying an old kids’ trailer, but in the end the Travoy was too nifty to resist. Thanks for the Travoy mini review. I have been considering one for some time. Now what can you tell us about Mr Dottie’s trailer hauling bike. I like the idea of mustache bars but have yet to try them. The Travoy is a very cool little gadget and I hope to have a full review up in January. PLEASE more details on Mr. Dottie’s bike if possible! I have been struggling to find the “perfect” commuter for ages and his combines so many things I want – disc brakes, albatross/moustache bars, bar-end single shifter?, looks like he added a hub light as well? I checked Civia’s website and I have notice that they drastically reduced the number of models they make; didn’t see any frames for disc/belt drives. Thank you! Cool! A friend of mine has one of those and she LOVES it. We’re moving out of the sticks and back to civilization soon. 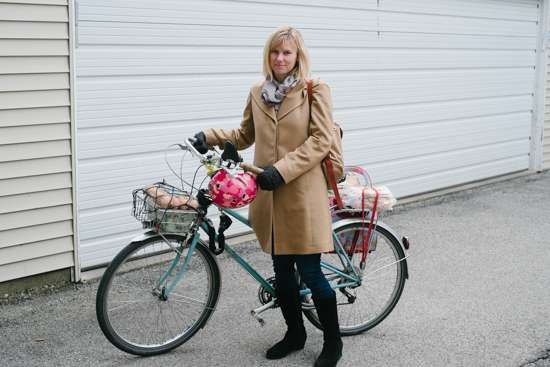 Maybe I’ll be able to start shopping by bike again! I’ve missed it. I might have to look into getting a Burley Travoy. Hello! I love shopping by bike. Feels good to accomplish something so useful while happily pedaling down the street at the same time. :) Let me know if you have any specific questions about the Travoy. I use it as a shopping cart at Trader Joe. Easy to do with the kickstand that can stay down at all times, even while rolling. It’s a nifty tool for city living! I’m single so I don’t have a whole lot to grocery shop. But I am always looking for a solution for hauling bulky items. Last month, I saw a vacuum on sale and thought how can I haul that home? I didn’t end up buying it. I can see myself using the trailer for this purpose! Knittybike, you could easily strap a vacuum cleaner to this trailer and haul it home. :) Perhaps you could make friends with someone who can lend you her bike trailer, if you need to haul stuff only occasionally. Do you have any trouble with the trailer and wind? No trouble with wind so far, Jim, although we’ve only taken it a couple of miles to the store and back on side streets. Thank you for your interesting posts. Wishing all at LGRAB a peaceful, joyful and prosperous Year 2015. Thank you, and to you as well, lem! I’ve looked at those trailers too. Well, I was looking at it for a friend. I need something that serves multi-purpose, including distance touring. I have a BOB and I LOVE it. I’ve hauled that thing for 12 years now through 13 states. I’ve not used it for grocery shopping yet. It’s a little more difficult with that where I live since it’s 12 miles out in the country. (that may be an excuse!) Good on you 2 for this! Hi Suzie, I can’t speak to that because I’ve never taken the trailer that far. My guess is that this trailer is not quite hardy enough, but I think I remember seeing a blog about someone using it for bike touring. Maybe you can google around and find it. Good luck!